Auckland is where most working holiday adventures begin! Meet countless others who will be starting (or just finishing) their working holiday in New Zealand. Have all the conveniences a large city can offer, while taking advantage of the awesome activities. We’re talking the Sky Tower, bungy jumping off the Auckland Harbour Bridge, Rangitoto Island, Waiheke Island, the Waitakere Ranges and so much more! Here are six reasons to start your working holiday in Auckland. 1. Start in New Zealand’s most buzzing city! For that cosmopolitan lifestyle where there’s always something going on, Auckland is your place! As New Zealand’s largest city, you can expect to find loads of events, nightlife and things to do. Not to mention, Auckland has all the services needed to start your gap year in New Zealand, from banks to outlet stores to the largest transport hubs in the country – ideal to get started with travelling New Zealand. 2. We are based here! You will have the support of Working Holiday Starter to kickstart your working holiday in Auckland! We’ll help you sort out your bank account, get a New Zealand tax number, and all the nitty-gritty paperwork involved with doing a working holiday in New Zealand. In between looking for work (which we help you with too), get loads of discounts on activities and local advice so you can make the most of Auckland while you’re here. Just check out the New Zealand Arrival Packs inclusions for more details. 3. Find a job fast! Queenstown is a town that often relies on seasonal workers to run. Whether it’s working in the ski fields in winter or working at a bar in the busy town in summer, Queenstown needs workers like you throughout the year. This is perfect for working holidaymakers who want to work for a few months but also want to take the time to travel the country. 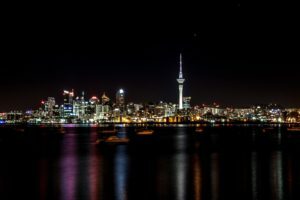 As the largest city in New Zealand, Auckland has plenty of job opportunities over a huge variety of professions. Whether you want to live and work in Auckland or elsewhere, we’ll help you stand out above the rest with our Job Workshop. Check out the Starter Packs on offer to find out more. The beauty of Auckland is that it really has something for everyone. Enjoy the multi-cultural vibe of Auckland city centre and its inner suburbs with awesome museums, eateries and bars. Then, get a dose of nature by taking a quick ferry ride out to Rangitoto Island, a volcanic island bird sanctuary, or the beach and winery-filled Waiheke Island. Or if you are looking for pure adrenaline, jump from the Sky Tower, bungy jump from the Auckland Harbour Bridge or skydive over Auckland. Auckland Airport is New Zealand’s largest international airport. More flights from a wider range of destinations arrive in Auckland every single day making Auckland a cheaper arrival destination than any other airport in New Zealand. Save some precious dollars and arrive in Auckland! Auckland is in the prime location to explore the North Island of New Zealand. North of Auckland, you have the stunning Bay of Islands with its 144 islands to discover. South of Auckland, there’s the volcanic centre of the North Island where you can hike over active volcanoes, as well as true Middle-earth scenery at Hobbiton and Mt Ngauruhoe (Mt Doom).